ServiceMaster Advantage is readily available when you need assistance with commercial disaster restoration services in Greater Houston. We specialize in a variety of restoration services, and when you have water damage in your business facility, warehouse, or office, ServiceMaster Advantage can help. Water damage can occur at any given time, all it takes is a simple burst pipe, faulty drainage system, or malfunctioning appliance, or something as extreme as a violent storm to damage your commercial property. Depending on the severity of the water damage, it may require you to shut down your office or storefront potentially resulting in lost business, customers, and revenue. When it comes to your business, we’re fully aware that you need your facility or office to be operating again as soon as possible. 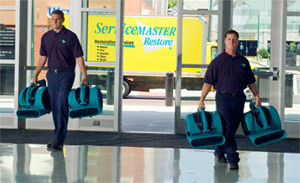 ServiceMaster Advantage offers 24/7 emergency services. Once you discover water damage, call us and we’ll have a team at your commercial location to begin the cleanup and restoration process immediately, at any time of the day or night. We understand how detrimental it can be for a business to close its doors temporarily, and with our highly trained, experienced, and certified water damage restoration technicians in Houston, we’ll be able to repair and restore your business facility back to its rightful state. When a water damage disaster occurs within your commercial facility in Greater Houston, trust the local disaster restoration experts at ServiceMaster Advantage. Call us today for additional details or if you’re in need of services!